There was one person in the home who says she was asleep when the vehicle crashed into her window. According to a press release from the Bibb County Sheriff's Department, the driver of the car has now been identified as Damien DeShun Nolen, 28, of Warner Robins. They say Nolen drove through a red light at the intersection of Arkwright Road at the I-75 off ramp. When Bibb deputies attempted to conduct a traffic stop with Nolen, he sped off leading deputies on a high speed chase towards downtown Macon. 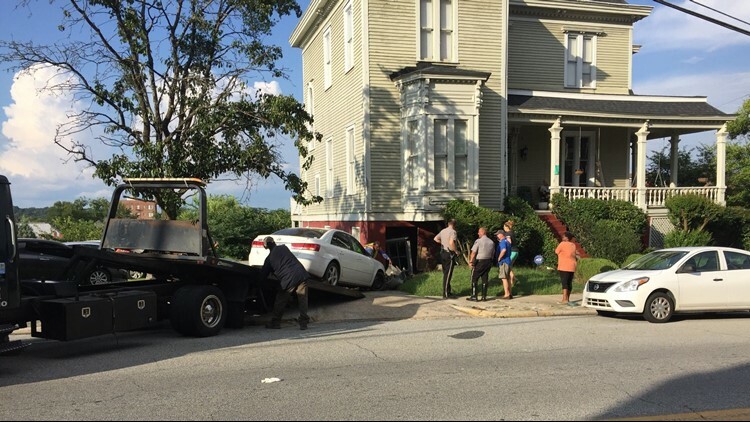 The chase ended when the driver lost control of the vehicle, and collided with an apartment located at 853 Washington Avenue. Nolen also had two passengers in the vehicle with him. One was released at the scene and the other was taken to the hospital for complaints. No one else was injured during the incident. Nolen is currently being held for several traffic charges including driving with a suspended license, fleeing and eluding, hit and run and felony possession of marijuana. A high speed chase ended when a car crashed into a home on Washington Avenue. According to Georgia State Patrol, the chase started around 6 p.m. near Northside Drive and Tom Hill Sr. Blvd. involving GSP troopers and a white Hyundai Elantra. The chase continued until the suspects vehicle lost control and crashed into a home at 853 Washington Avenue. Three people were inside the vehicle at the time of the crash. The driver was taken into custody at the scene by the Bibb County Sheriffs Department, but it's still unclear if the two passengers were arrested. There was a woman asleep on the couch in the basement of the home who says she woke up to a car crashing into her window. The Hyundai also hit another vehicle on Old Holton Road during the chase. We will continue to bring you updates as we get more information.